This was my first attempt at adding stitching to my paper crafts. And I like it! I specifically chose this paper from my DCWV (Die Cuts With a View) paper pad because I love the colors. I only had one sheet like this, so I carefully selected the part of the page that I wanted for the background on the card (6-3/4″ x 3″) and cut my letters out of a different section. The letters are cut from my Cricut, using Plantin Schoolbook on the roly poly setting, 1-1/4″. Before the stitching, it was difficult to see the letters when I placed them on top of the paper. I glued the letters on with my Tombow glue, so the stitching would not actually have to hold the letters in place. TIP: If you don’t have a Cricut, it would be easy to print the letters with your printer, choosing any font you like. The edges don’t have to be perfect when you cut them out because you will hide them with the stitching. Once your letters are placed, you will need to pierce holes for the thread. 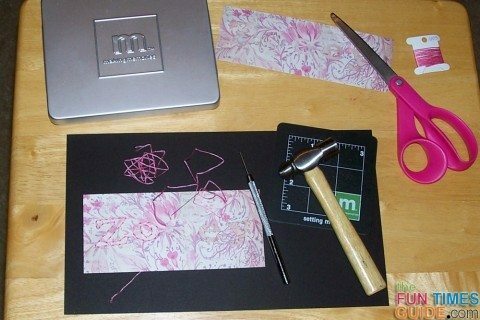 I used the paper piercer and hammer from my Making Memories tool kit. Here you can see the start of the stitching and the rest of the holes. The thread I used is from my cross-stitching craft box, DMC floss (#603 cranberry) that perfectly matches one of the shades in the paper. The DMC floss comes in a skein of 6 strands and I used 3 for this project (about 12 inches). You can use any length you want, but I’ve learned that longer lengths tend to tangle more easily. For the needle, I started using one of the 2 paper-piercing needles from the tool kit. Both needles are fairly thick and made the holes much larger than I wanted them to be — so I ended up using a regular sewing needle. Thread the 3 strands in the needle and pull about 3 inches through. Make a knot in the other end. Looking at your first letter, imagine that 4 holes in a row are numbered 1, 2, 3 and 4. Starting with hole #1 pull the needle up from the backside of the paper. Pull the thread all the way until you hit the knot. Next, push the needle down through hole #2. Now use the third hole; pull the thread up. You will push the needle back down through hole #2, connecting the thread into a line that will form around the letter. Repeat this process coming up through hole #4 and so on — moving on to each of the next letters. When you have about 1.5″ of thread left, stop with the needle and thread on the backside of the paper. Tie a knot any way you like. I take the needle under a strand that has already been stitched and pull half-way through. You will see a loop… point the needle inside the loop and pull taut. Repeat. You can now cut the remaining thread about .25″ from your knot. Start again with the next 3 strands until you are finished with your letters. 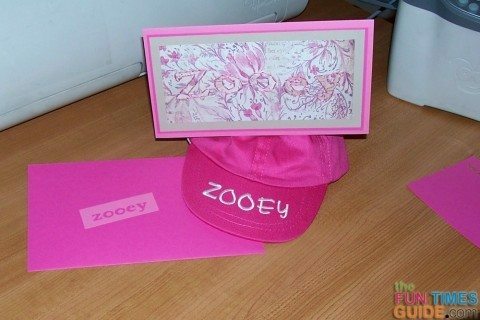 I glued the piece with the stitching onto light tan cardstock (7-1/4″ x 3-3/4″), then onto dark pink cardstock paper (7-1/2″ by 4″), then onto my card made from 7-3/4″ by 8-1/2″ of light pink cardstock — folded in half with a horizontal fold. For the inside of the card I cut the word “welcome” from the dark and pink cardstock, using Plantin Schoolbook 1/2″ on the roly poly setting. I placed a 7-1/4″ by 3-1/4″ piece of light tan paper inside the card, then layered the “welcome” letters — first dark pink then light pink on top. I made a matching envelope from the leftover dark pink cardstock paper using these DIY envelope instructions. Since this card was going to be mailed inside a box, I didn’t need to prepare the envelope for mailing — with a name and address. 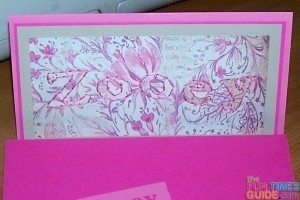 So I cut “zooey” from the light pink paper (same size as “welcome”) and used the outline to decorate the front. 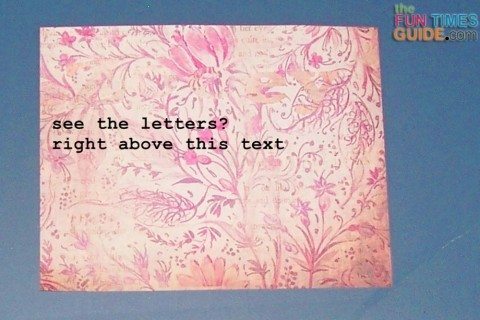 TIP: If you do this, after you poke out the letters, be sure to save the tiny pieces from the center of the “o”s and “e” to glue on the envelope so the letters will look whole. Otherwise, you will have incomplete letters. Stitching on your letters can add color and dimension that paper alone cannot. 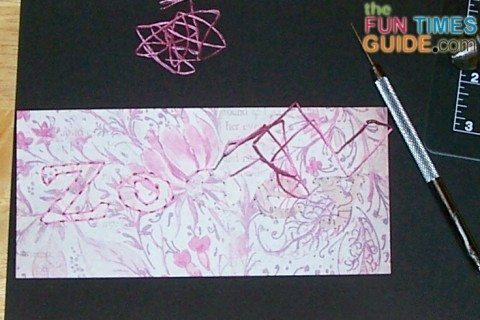 Have fun exploring how stitching will work on your paper projects!